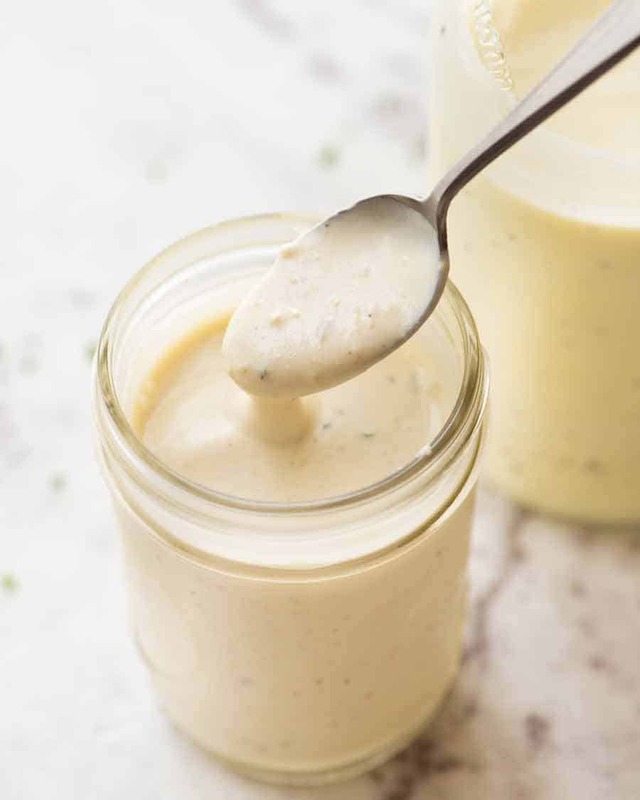 Five creamy Yogurt Salad Dressings made with NO MAYONNAISE! These healthier creamy salad dressings taste so good, you might ditch that jar of mayo for good. 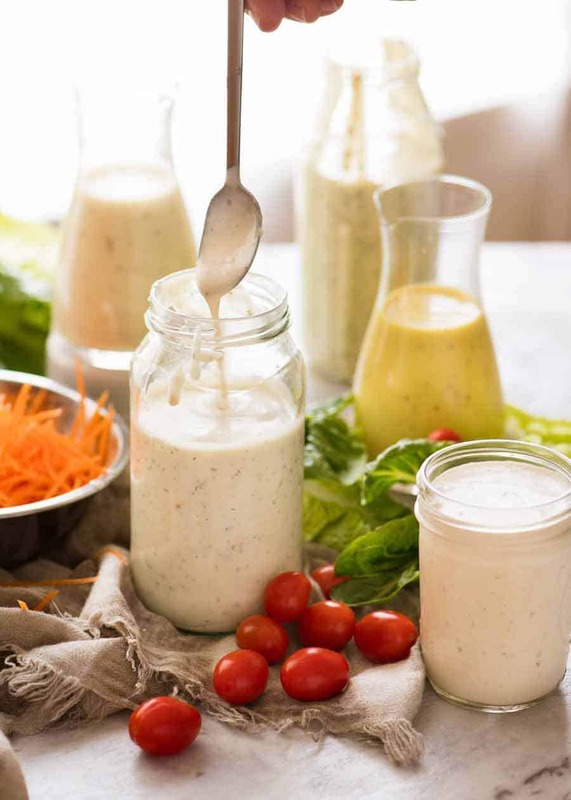 Choose from an all purpose Lemon Yogurt Dressing, a No Mayo Potato Salad Dressing, a flavour packed healthier Yogurt Caesar Salad Dressing, Yogurt Ranch Dressing AND a wickedly creamy oil-free Honey Mustard Dressing! Brought to you in partnership with Farmers Union Greek-style Yogurt. Today, I’m sharing my favourite Yogurt Salad Dressing recipes that I use in place of popular mayo based salad dressings. There will always be occasions that call for a grand classic Potato Salad or everyone’s favourite Coleslaw, in all it’s mayo-loaded glory! But in these parts, especially with my group of friends, non-mayo salad options are in high demand. 1. Creamy Lemon Yogurt Salad Dressing – all purpose beauty! 2. Yogurt Potato Salad Dressing – I love the little pops of mustard seeds in this. 3. 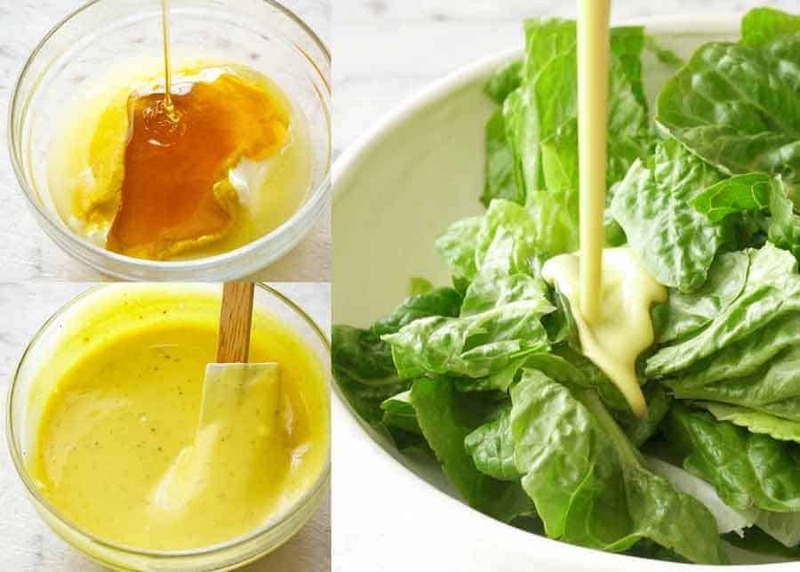 Oil Free Honey Mustard Dressing – take my favourite Honey Mustard Dressing and switch all the oil with yogurt = same creamy lusciousness with less guilt! 4. Greek Yogurt Ranch Dressing – another all purpose beauty (because I use this on everything). 5. 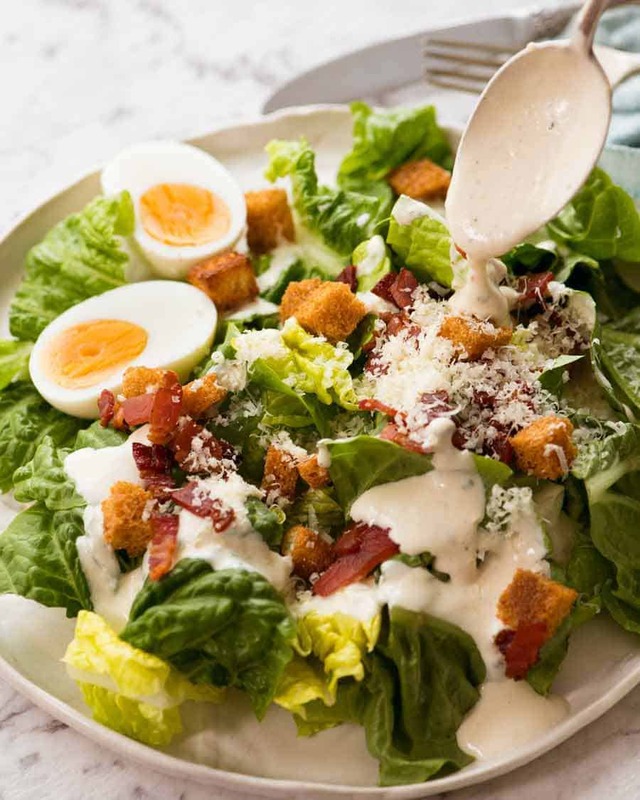 Healthier Yogurt Caesar Dressing – this packs a serious flavour punch, just like the classic Caesar Salad Dressing. The essential base ingredient for all these dressings is THIS – a good thick Greek yogurt. 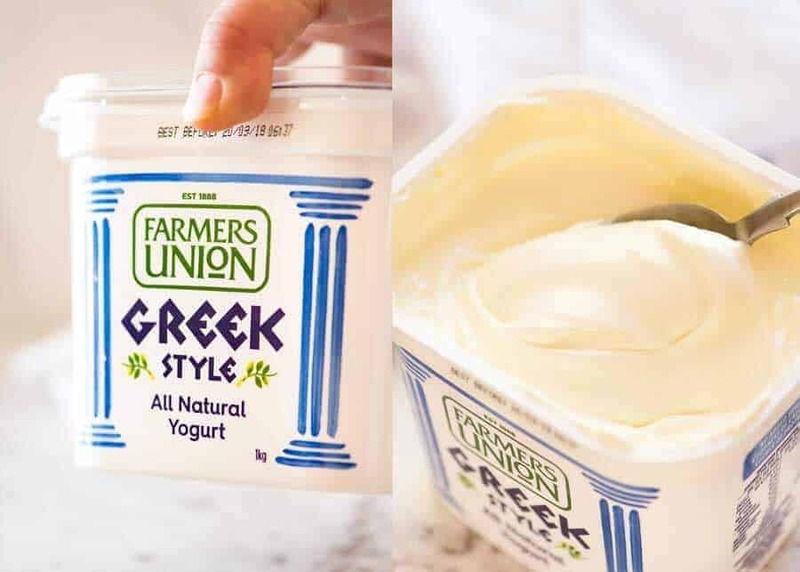 My choice: Farmers Union Greek-Style Yogurt. Always has been, for as long as I can remember. Here’s a rundown on each of the dressings and what to use them for. This is my all purpose yogurt dressing, the one I use for any salad whether it’s a simple garden salad, a full loaded chicken salad, a pasta salad (like classic Macaroni Salad), Creamy Broccoli Salad or Coleslaw. 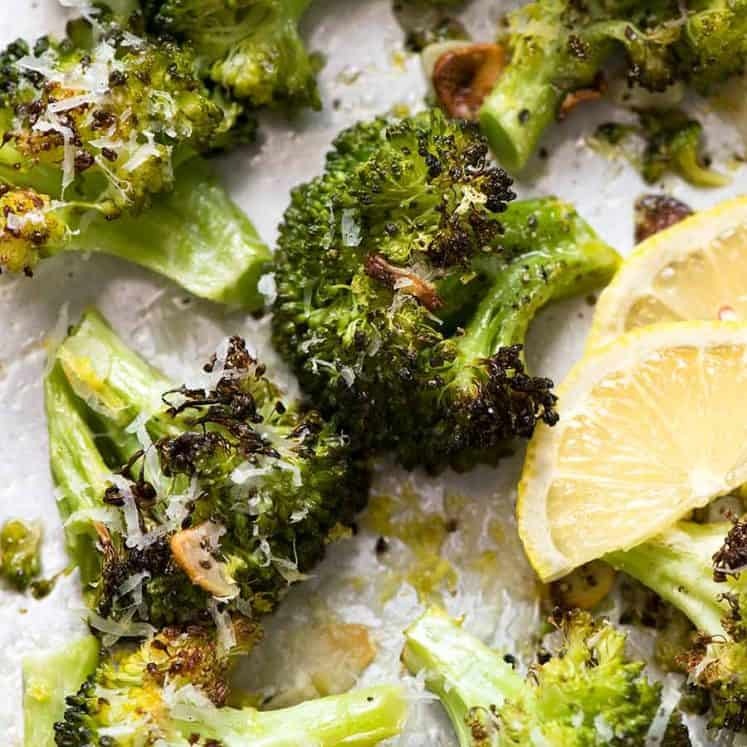 It’s made with Greek yogurt, olive oil, garlic, and a nice hit of freshness from lemon. A fabulously creamy, flavour loaded potato salad dressing made without mayonnaise IS possible! 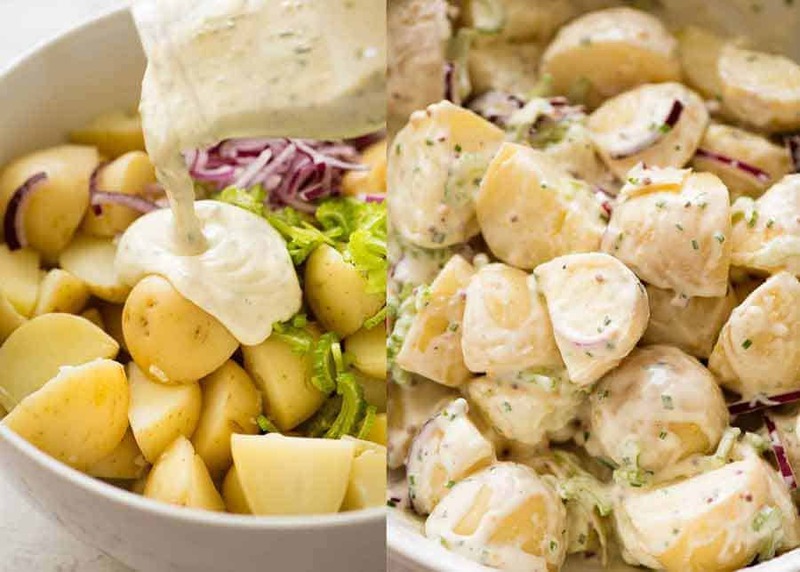 Made with Greek yogurt, a good dose of both Dijon and wholegrain mustard, plus a nice hit of fresh herbs, any potato salad tossed with this Yogurt Potato Salad Dressing is terrific on the day but is even BETTER the next day…. Just use this Potato Salad recipe and switch the dressing for this one! The classic Honey Mustard Dressing is made with equal parts honey, mustard, vinegar and oil. When you give it a big shake, the oil emulsifies with the other ingredients so you end up with a beautiful creamy dressing. In this healthier version, the oil is switched for yogurt. It’s just as creamy and luscious and indulgent tasting, with far lower calories. It’s a winner! A healthier version of America’s most popular salad dressing! Usually made with mayonnaise and buttermilk, this healthier Ranch Dressing is made with Greek Yogurt and olive oil, plus a good dose of Ranch Dressing seasonings. Ranch Dressing is so good, I use it as an all purpose dressing for anything that usually calls for a creamy dressing, from garden salads to pasta salads and corn salad. But my favourite is to use it for what I call a SouthWest Salad, pictured below. 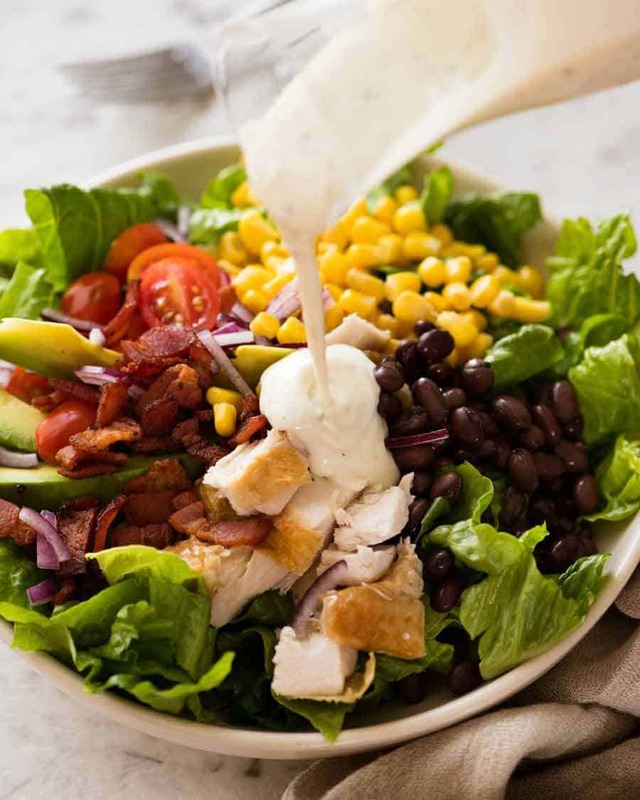 Lettuce, cherry tomatoes, corn, black beans, red onion, optional chicken and bacon, drizzled with this Yogurt Ranch Dressing. It’s so good!! If you have it in your head that yogurt dressings are bland, try this healthier Yogurt Caesar Salad Dressing. It will knock your socks off! It’s SO GOOD it really makes me question why I should ever make the mayo version again! 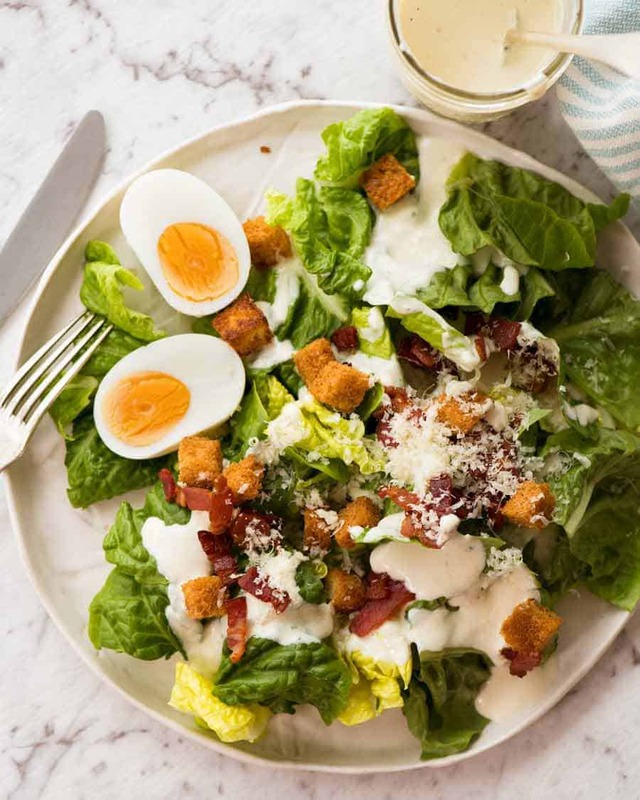 Use this classic Caesar Salad recipe (optional chicken) with this healthier Yogurt Caesar Dressing. “Healthy” has a bad reputation for meaning “bland”. 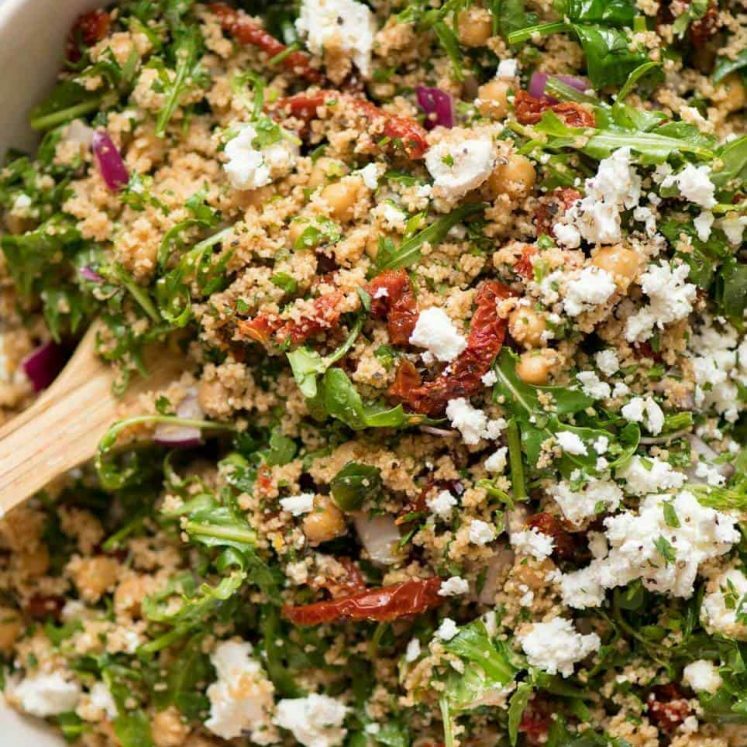 There’s no denying that when you strip fat out of salad dressings, you lose a certain element of creaminess on your palette as you munch through a pile of crunchy greens. 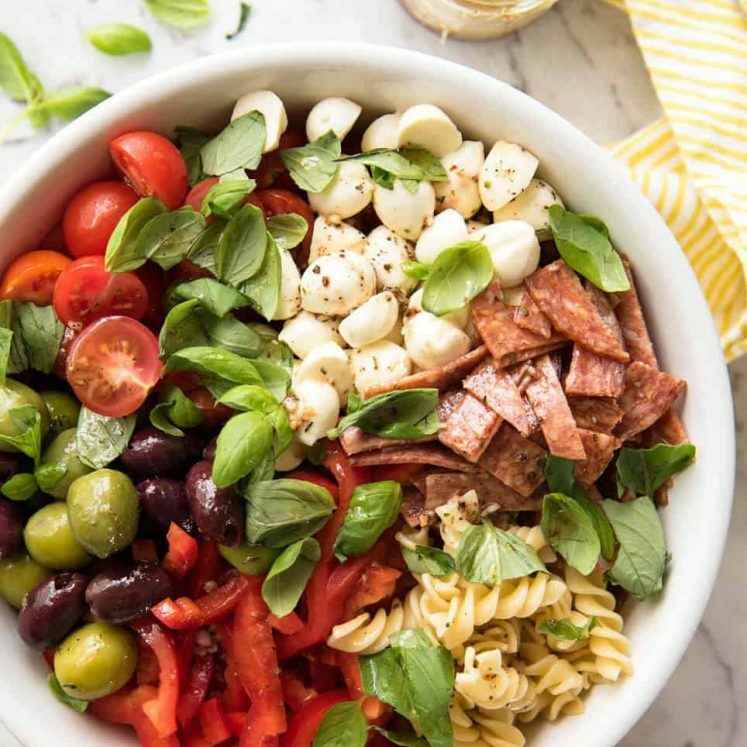 But by using a good, thick yogurt in place of mayonnaise and adjusting seasonings to compensate for the loss of fat in the dressings, you can still make very, very good creamy dressings that you can use generously on your salads. I use these dressings far more frequently in day to day life than I do mayonnaise based ones. Recipe video above. Here's 5 very, very good creamy dressings made with yogurt instead of mayonnaise. All the flavour of their traditional mayo-based counterparts, but less fat and better for you! You might ditch that jar of mayo for good! Mix ingredients in a bowl. Set aside for 30 minutes+ to allow flavours to develop. Use milk to adjust to desired consistency. Blitz in a food processor until smooth. Use milk to adjust consistency. 1. 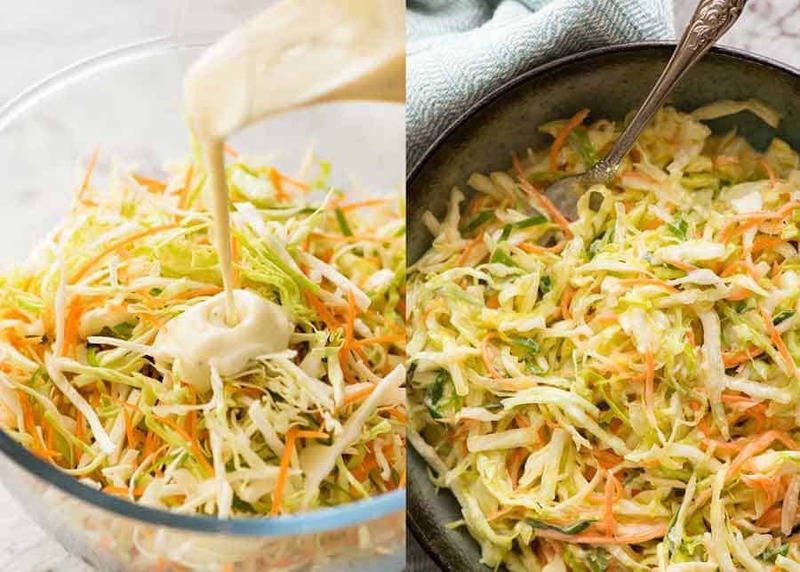 Creamy Lemon Dressing: Great all rounder, use for leafy greens, garden salads, Coleslaw, Macaroni Salad. 2. Ranch: Great all rounder, use for leafy greens, garden salads, SouthWest Salad (Note 3), Creamy Broccoli Salad, Macaroni Salad, drizzle over iceberg wedges. 3. Potato Salad Dressing: For potato salad. 4. Honey Mustard Dressing: Use for leafy greens, garden salads, a chicken saladlike this one, would also be great with this Roast Sweet Potato Salad. 5. Caesar Salad: For Caesar salad - chicken is optional. Also terrific to dipping in crisp lettuce leaves and vegetable sticks. Would also be terrific on this Mexican Corn Salad. 2. Anchovy fillets are key to achieve a true restaurant quality flavour for Caesar Salad. You can't taste it, it's the salt for the dressing. Use the dark brown anchovy fillets in oil , not the white anchovy fillets that are brined in vinegar, not oil. Substitutions: If you really prefer not to use anchovies, 1 tsp of fish sauce will be an adequate substitute. If you're allergic to fish, use 1 tsp light or all purpose soy sauce. 3. Storage - These dressings keep for 3 days in the fridge, best to take them out 30 minutes prior to using. He spends a lot of time doing this. 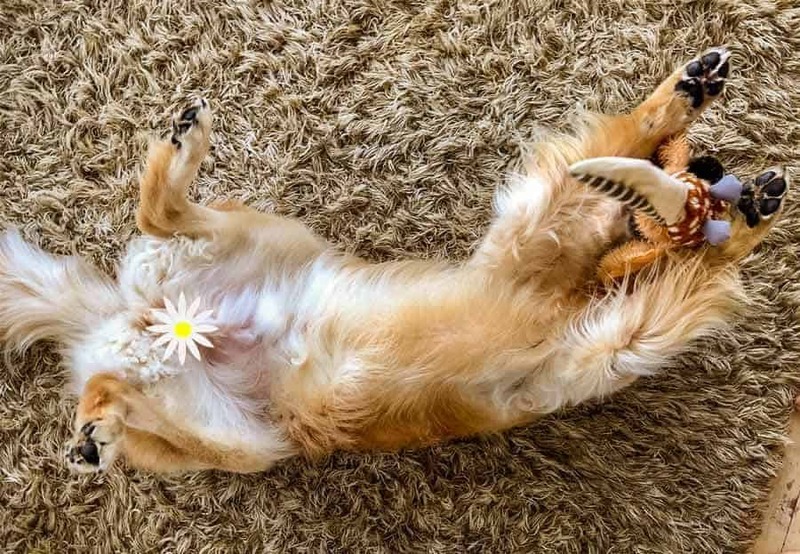 I spend a lot of time vacuuming that darn rug. It fills my entire Dyson, every time!! Today’s recipe is brought to you courtesy of Farmers Union. I’ve used their Greek style natural yogurt for as long as I can remember. So it was a no brainer when they asked if I’d create a recipe for them!! Nagi, these look wonderful but can you tell me how many tablespoons, or servings the make so I can calculate the points? Thanks! Hi Ricki, I suppose it depends on personal preference and how much dressing you put on a salad, I can calculate the total for you if you’d like? The ranch dressing rocks! It’s even good with nonfat yogurt. Great recipe! I’m so glad you’re converted Maria!! Nagi, you’re a blast! Ran into you looking for slow cook Turkey receipe, it was stupendous, many thanks. 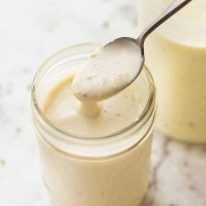 Yogurt dressings, I almost gagged when my 40 year old son said his favorite salad dressing was grocery store ranch, so I was delighted to see & send your YOGURT version, it sound wonderful & I’m waiting for his rave review. Many thanks. A newer member. PS. I miss my “Dozer”, love yours. Haha! I’m so happy you loved the turkey! It’s just so easy to make salad dressings at home – I hope he loves it and I’ll await to hear his feedback! this is just suggestion. I love your salads and dressings in fact I love all your recipes. Can I omit the sugar or substitute it for something else? I made the lemon dressing for a green salad to serve with monte cristo sandwiches and it was lovely. Looking forward to trying the other dressings, and will look for something to replace the anchovies, since I’m vegetarian. Thanks for a great recipe! Only google is working now! I eat yogurt alot cuz mayo makes me sick…lactose. Delicious! I look forward to trying all of these!! Hope you and Dozer are well! Dozer, Dozer….yes agree it’s lots of hard work to clean up. As for salad dressing am happy to use yoghurt. Can’t wait for more stable temp so I can make my own yoghurt. Yum! Last two days was hot, bit hi it but yesterday all day heavy clouds. Was happy spend both days at beach, lots of walking and bit in water. But yesterday around 04 Pm big storm, thunder, heavy downpour in 15 min flash flooding when people are going home. Will be more storms over next3 days and two days will be unusual cold snap, brrrr, brrr. Will be cooking yesterday got whole roast chicken for 04.50 dollars so am making salad, chicken spread for s/w with hips of fresh herbs from garden, and risotto with mosh room and chicken. Also got them cheap ,400 gr only 04.00. Love cucumber salad with dill, garlic, yoghurt and smoke paprika, yum. Have good week!